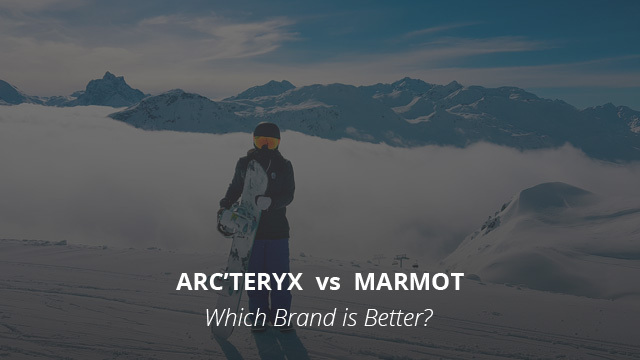 Arc’teryx vs Marmot: Which Brand is Better? We have already talked about Arc’teryx and Marmot, and compared them to other brands in previous articles. These are two of the most renowned outdoor clothing brands, Arc’teryx being Canada-based, and Marmot being US-based. Today we’ll compare them and see how they measure up against each other, and finally decide which one of them is the better option. It was in 1989 when Dave Lane along with fellow mountain climbers founded the company under the name Rock Solid. Within two years, in 1991, it was renamed Arc’teryx to represent the innovation the company was carrying out to redefine the world of outdoor clothing and gear. As the venture was started out by a group of mountain climbers, the company initially dealt with climbing gear only. Some notable items in this line included the Vapor harness and the Bora backpack (check it out on Amazon), manufactured while using the thermolamination technology. They are still among the most sought out products to this day. Arc’teryx stepped into the domain of outdoor clothing after obtaining the license for using one of the highest performing fabric technologies, the Gore-Tex fabric technology. With the use of technology, the company creates products that combat Canada’s harsh weather. Today, Arc’teryx is one of the leading outdoor clothing brands that bring innovation with every product. It has a line of product for every distinct need and preference of its large customer base. Keeping in mind the apparel needs of law-enforcement personnel, the company has a separate LEAF (Law Enforcement & Armed Forces) product line too. Lavish products that are “to-die-for” often come at an unavoidable environmental cost. Many manufacturing units are not careful while disposing of their industrial waste. When analyzing a product, as a responsible shopper, it is important to look at the practices of its manufacturer. Brands that carry out their manufacturing ethically and without harming the environment should be preferred over those that show carelessness. Arc’teryx is one of the brands that can rightly boast about their ethical practices. Raw materials for animal-based products are sourced through suppliers that treat animals in a humane manner. Arc’teryx is also cautious about how its business affects local communities and the environment. On this basis, it uses Bluesign® certified raw materials and fabrics, ensuring that all products are not only safe for human use but are also not detrimental to the environment. For the materials or production that is outsourced abroad, the company works with only those entities that follow the regulations regarding laborers’ rights. When it comes to purchasing clothing, another most important feature to consider is the product’s durability and sustainability. Products like outdoor clothing are chosen based on their longevity as, most likely, such gear is used over a period of several years and it is important that a product is durable enough for daily use. The material used in manufacturing is of high quality and does not wear out easily. The company also offers repair facilities to ensure that its customers are receiving the best of after-sales services. When it comes to technology, the company uses state-of-the-art Gore-Tex technology and inhouse-manufactured AC2 technology. In the end, what the company provides is a series of products that are unique and address everything that a consumer is looking for. Let’s now analyze Arc’teryx products a little bit in detail. For this purpose, we have chosen two of its most popular jackets. 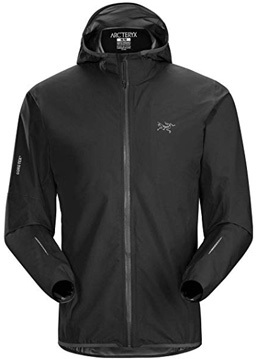 Slim fit and trim, Arc’teryx Men’s Norvan Jacket (check it out on Amazon) uses Gore-Tex protection and lets the person wearing the jacket carry out high output activities in windy and wet weather. Because of the use of N20p 3L Gore-Tex fabric with GORE C-KNIT backer technology, the product is light in weight and highly breathable. It is also durable and provides waterproof protection. For enhanced visibility in low light, reflective blazes have been put on the back and the sleeves of this jacket. Other features of the product include an internal pocket with zip and an elasticized hem. The Atom SL Hoody for women (check it out on Amazon) provides warmth in mildly cool conditions. You can wear the jacket during early morning hours without being suffocated under the fabric’s weight. Soft and easy to carry, the lightweight jacket has the Tyono 20 shell material which cuts wind chills and is breathable. The insulation is provided by the highly compressible 40g/m² Coreloft Compact and the mesh is 100% polyester. Arc’teryx is a high-end brand with prices that start at around $150 and go upwards of $600. Keeping in mind the fabric and technology used and the minimalistic design each product has, their prices are reasonable. This is also because these jackets are very long-lasting. Established more than a decade before Arc’teryx, in 1974, Marmot is one of the leading brands in the US, catering to the market of outdoor clothing and gear enthusiasts. It also enjoys the title of being the trailblazer in the US in collaborating with Gore-Tex to manufacture weather-protection products that are lighter in weight but stronger in weather resistance. When Eric Reynolds and Dave Huntley founded the company, they were a couple of mountain climbers who wanted to make products to combat weather conditions during their climbs. What turned out to be a breakthrough for the duo was Eric’s meeting with a film director who met with him during one of Eric’s many ascents. It was there that the company got its biggest order of 108 puffy jackets. Since then the company has been performing consistently and is now one of the top names among outdoor clothing brands. Like Arc’teryx, Marmot also adopts environmental-friendly procedures for the manufacturing of its products. It stays away from Phthalates and PVC to reduce their hazardous impact on the environment. As for the materials used, the main ones are polyester and nylon, which are then developed to create various fabric technologies. Having had decades of experience in this field, along with Gore-Tex, Marmot now also uses its own technologies such as MemBrain®, Eco Featherless, NanoPro™ and EvoDry for guaranteeing the performance of its products. 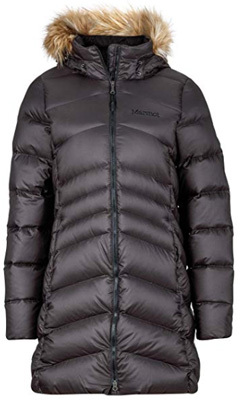 With their unique and sleek designs, Marmot’s jackets are very popular and have captured a large share of the market. 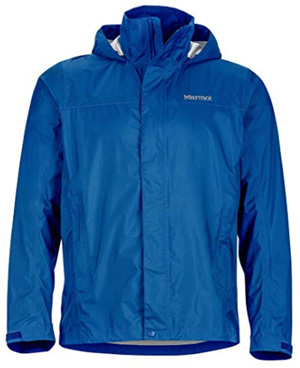 From Marmot’s popular products, we have chosen the following two jackets. 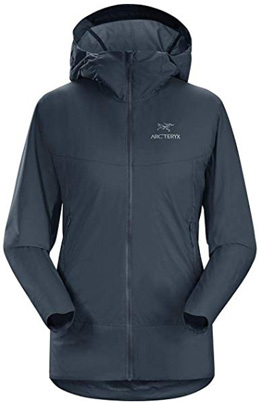 The first is the PreCip jacket for men (check it out on Amazon) which is similar to the Arc’teryx Norvan jacket that we saw above, as they both provide a great resistance against water. It is made of 100% NanoPro Ripstop Nylon fabric which gives it weather-resistant qualities. The jacket comes with an adjustable hood that rolls into the collar, when not needed. A storm placket covers its full-length zipper and the chin guard protects the chin or neck from getting chafed by the zipper. For women we have selected the Montreal Puffer Parka (check it out on Amazon), a 100% polyester, knee-length down coat which is perfect for everyday wear. Its moisture-resistant Down Defender treatment on the 700 fill-power down insulation keeps you warm by resisting moisture for longer. It also has a removable synthetic fur and, unlike the Atom SL Hoody from Arc’teryx that we saw above, this coat is heavier and a bit puffy. Marmot’s products, like Arc’teryx’ ones, are a bit pricey, but they provide some variety and offer some affordable options that start at around $100. Their most expensive items are the parkas and down jackets. The company uses high-quality fabric that lasts for several years. Taking their durability and performance into consideration, yes, these jackets are worth their price. In many ways, the two brands are similar to each other. Both use high-quality raw materials and are careful of their business practices. The price range of the products is also on the same spectrum, with Arc’teryx being a bit pricier. Arc’teryx, however, provides designs that are minimalist and with a trendier look in our opinion. It is also one of the most popular and recommended brands online for outdoor clothing. So, keeping all these aspects in mind, quality, price, performance, design, durability and popularity, we have to give this one to Arc’teryx. However, as with many other brands, the choice comes down to personal preferences and depends on what you will be using these products for.